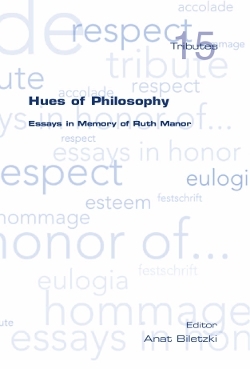 This volume, in memory of Ruth Manor, consists of articles presented at her memorial conference at Tel Aviv University. The articles, by colleagues and students, friends and family, represent the wide range of interest and expertise that Manor brought to her teaching and research - from formal logic to pragmatics, and from rhetoric to ethics. The collection includes articles by Jaakko Hintikka (on the sorites paradox), Arnon Avron (on logical connectives), Oron Shagrir (on supervenience), Eli Dresner (on holism and measurement), Eran Guter (on new media), Amnon Wolman (on music), Anat Matar (on the language or war), and Anat Biletzki (on living with paradoxes). Emblematic of Manor's huge panoply of philosophical themes, the diversity and variety of subjects covered also portray here analytical profundity and logical proficiency at always "seeing connections".